G299.2-2.9 is a supernova remnant found about 16,000 light years from Earth in the Milky Way galaxy. It is the remains of a Type Ia supernova, the class of explosions astronomers use to measure the accelerating Universe and dark energy. Because it is older than most Type Ia remnants astronomers have found, G299.2-2.9 gives a look at how the remnants evolve over time. G299.2-2.9 is an intriguing supernova remnant found about 16,000 light years away in the Milky Way galaxy . 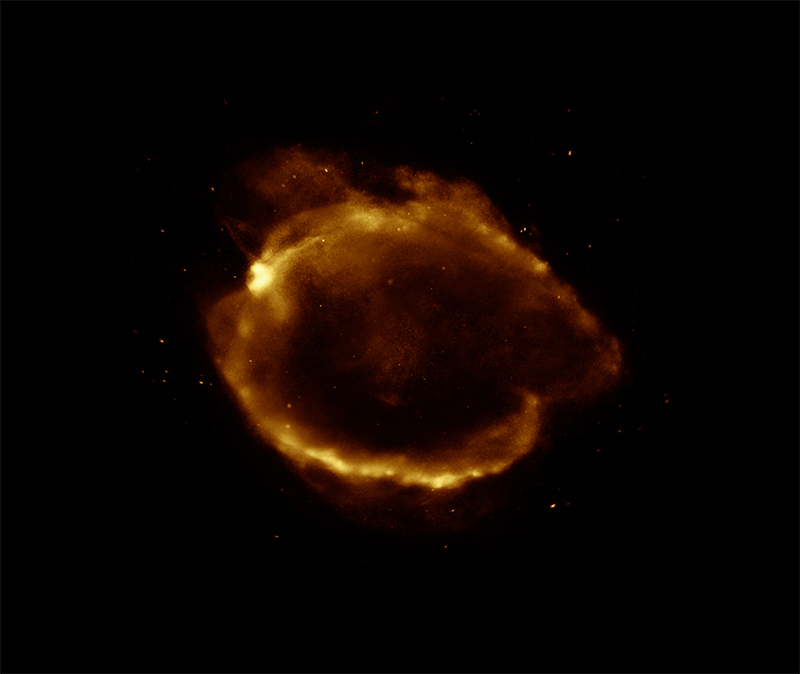 Evidence points to G299.2-2.9 being the remains of a Type Ia supernova, where a white dwarf has grown sufficiently massive to cause a thermonuclear explosion. 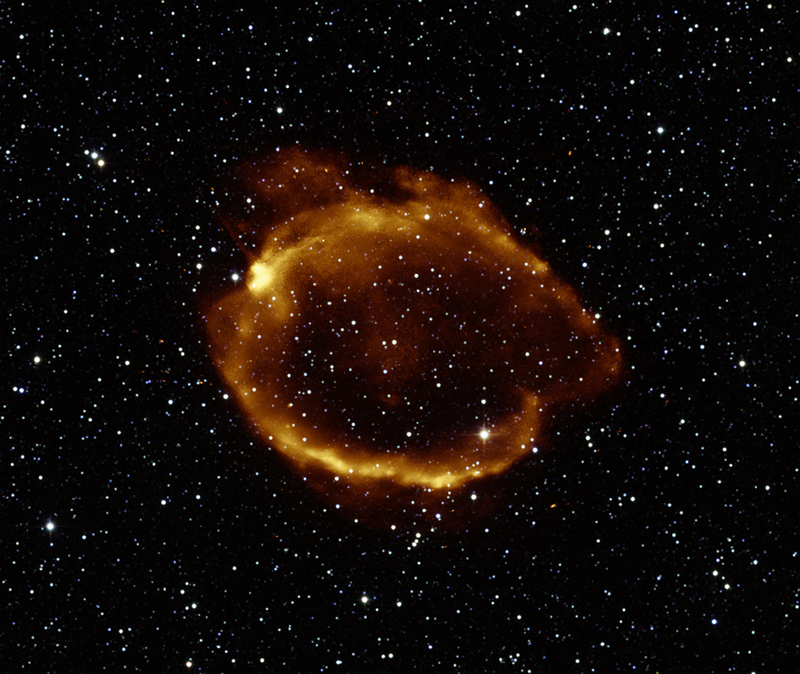 Because it is older than most supernova remnants caused by these explosions, at an age of about 4500 years, G299.2-2.9 provides astronomers with an excellent opportunity to study how these objects evolve over time. It also provides a probe of the Type Ia supernova explosion that produced this structure. This composite image shows G299.2-2.9 in X-ray light from Chandra, along with data from the ROSAT satellite (orange), that has been overlaid on an infrared image from the Two Micron All-Sky Survey (2MASS). The faint X-ray emission from the inner region reveals relatively large amounts of iron and silicon, as expected for a remnant of a Type Ia supernova. The outer shell of the remnant is complex, with at least a double shell structure. Typically, such a complex outer shell is associated with a star that has exploded into space where gas and dust are not uniformly distributed. Since most theories to explain Type Ia supernovas assume they go off in a uniform environment, detailed studies of this complicated outer shell should help astronomers improve their understanding of the environments where these explosions occur. It is very important to understand the details of Type Ia explosions because astronomers use them as cosmic mile markers to measure the accelerated expansion of the universe and study dark energy. The discovery of this accelerated expansion in the late 1990s led to the recent award of the Nobel Prize in Physics. Coordinates (J2000) RA 12h 15m 33.80s | Dec -65° 26´ 33.90"
It said "at an age of about 4500 years". That doesn't mean that it exploded 4500 years ago. Just curious to know how we are seeing a supernova remnant 16,000 light years away that exploded "about 4500 years" ago. Its a great discovery and will definitely shape our knowledge of space science. Thanks a lot for the post. I am totally amazed, I got to witness this, totally amazed!! About 16,000 light years from Earth. X-rays from Chandra X-ray Observatory, along with data from the ROSAT satellite and an infrared image from the Two Micron All-Sky Survey (2MASS). About 114 light years across. X-rays are gold and the infrared red, green and blue.